We are entering a time of light and color as the weather becomes warmer and summer is close at hand. 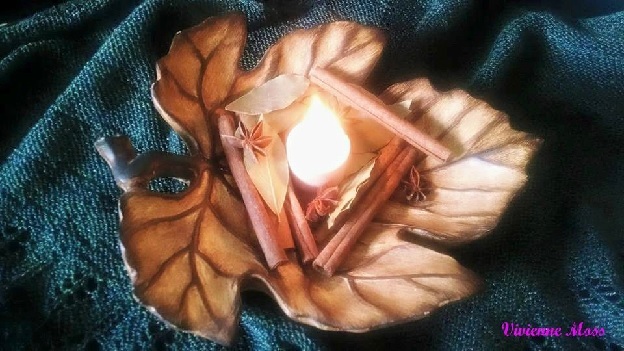 In honor of this burgeoning warmth, I thought it would be interesting to take a look at the basics of candle magick, employing the use of color for magickal workings and the metaphors of flame and fire, Light and Season… Enjoy..
Candle Magick makes use of the properties and energies of a candle, color, etc. to direct the focus of energy towards a desired outcome. It is for this reason that candles are used in High Magick and Ritual workings. They become the physical representation of God or Goddess, the transformative power that lights all others or the symbol of the inner fires of Will. Within our coven we routinely pour coven candles for each member annually. The wax used comes from the remainders of the previous year’s candles and is melted down. All contribute an herb or oil to the mix and we pour energy and intent into the heated wax. A large candle is poured that will be used in ritual by all and then smaller individual candles are poured for each member to take home. This becomes a way to connect energetically with coven mates if the individual is unable to be physically present for working or meeting. This past year we were unable to schedule a time for this, but we still had plenty of candle left to carry us through and maintain the connection. In doing spell work using a candle not only provides a point of focus, but also acts as a container for the energies gathered and worked upon. Allowing the candle to burn down completely releases the spell into the flow of universal law. Lighting the candle for several nights can build the effect and acts something like a slow simmer. Holding the heat and intensity, but carefully and slowly releasing the essence allowing all the flavors and nuances to mature. Candle magick is simple, easy and can be quite effective in its purpose. The beauty is that it can also be rather transparent to others, as many use candles as décor in their homes. Candles are portable and relatively easy to make, if you are so inclined. If you choose to make your own candles, additional items can be integrated. I have crushed a small crystal and added its energy to the wax. Herbs and oils are readily available and can enhance the general properties and even the timing of pouring the candle can bolster the intent. Aligning the pouring with New, Full or Waning moon energy customizes the effectiveness for the specific types of workings for which the candle will be used. Store bought candles can be similarly customized. Remove the wrapping and apply oil to the candle, anointing it with the properties of whatever oil you choose. Frankincense serves as durable purifier. And, Myrrh will stimulate the Higher Self and offer connection to spiritual realms. You can press finely crushed crystals into the base of the candle by heating the bottom slightly to soften the wax and then pressing it down into the crystalline substance, much like coating fish with breadcrumbs. Leaving the candle out under the moonlight of any particular phase can attune it to those particular energies. And, placing the candle in a window or outside (depending on the heat temperature) under the sun’s watchful eye can enliven the candle for use in solar, energy or fire workings. Scribing sigils, runes or other sacred markings on the candle and envisioning these symbols moving into the center of the candle can be used to sustain long-term workings. Each time the candle is relit envision the energy of the symbol emanating, much like an aura from within the candle. Additionally, using a specifically colored candle can enhance the effectiveness of the spell. Some basic colors are listed below. If you cannot find a specifically colored candle, a makeshift way is to use a small round mirror (found at most craft stores, and should be approx. 2-inches larger than the base diameter of the candle) and colored paper. Cut a circle just slightly larger than the candle base out of the colored paper that you have selected for the working. Place this on top of the mirror. Place a white candle on top of this. The reflective energies of the mirror will draw up the color from the paper into the candle’s field of energy. And, when the candle is lit the flame will enhance the glow reflecting back into the mirror and creating a beautiful energetic circuit of light and energy. White – Transpersonal Chakra, Light, Spirit, the reflection of all colors. Red – Root Chakra, Will, action, vitality, circulation. Pink – Used for love of the heart, relationships. Orange – Sacral Chakra, attraction, communication, energy. Yellow – Solar Plexus Chakra, well-being, concentration, intuition, health, strength. Green – Heart Chakra, health, healing, money, renewal, fertility. Blue – Throat Chakra, communication, healing, memory, calming and centering. Indigo – Brow Chakra, third eye psychic center, psychic awareness. Purple – Crown center, royal color, Deity, spiritual workings. Brown – Stability, the earth, growth, potential. Grey – Represents intuition, the astral, shade. Black – Contains and holds all colors, shields and filters. These are just a few very simple and basic ideas to get you started in how to use candles for magick. Be creative. See the candle as not only an object of Fire’s expression, but also containing the properties of Water (fluid wax when heated), Air (the aroma and oxygen accessed in keeping the candle light) and Earth, in its solid form. The element of Spirit is added from your intent infused and connected to the malleable form of wax, color, scent and more. And, the magick is in the ability to create Light in a small pocket of space that was not so brightly illumined just prior. Simple yet effective, candle magic is a central focus of enchantment in my home. 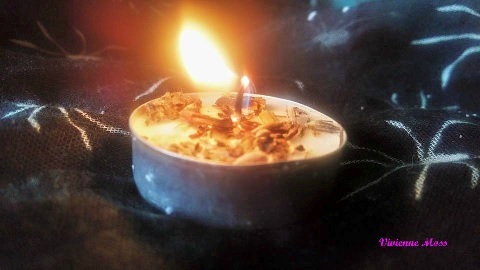 The creating of candle centered spells is both relaxing and invigorating. The choosing of the color, shape and scent of the candle is magic in the making. I can spend hours in a candle shop, relishing over all the vibrant color combinations and exotic aromas. The rubbing on of oils and rolling in enchanted herbs sends my senses into a whirlwind adventure into worlds of alluring charm. One of my favorite forms of candle magic is the creation of artistic offerings. The picture above is a hallowed offering to the Nature Spirits and Faery. The fashioning of this work of art is a scared act and the magic emanating from it can be felt every time I light the candle. I have many of these around my home filled with all kinds of found objects from nature. They are like mini altars and can easily be disguised as a center peace on the kitchen table or coffee table. For fast and easy candle magic, tea lights are the way to go. By adding a drop oil and a pinch of herbs appropriate for the spell, this simple charm is for those of us with busy lives. You can even carve some runes onto the top of the tea light with a toothpick or right out a charm of paper and place beneath the candle. If the scent of the burning herbs are overwhelming, sprinkle less herbs on the candle or simply sprinkle them around the candle. Make sure to burn this candle on a heatproof dish, the herbs and oil can catch fire. 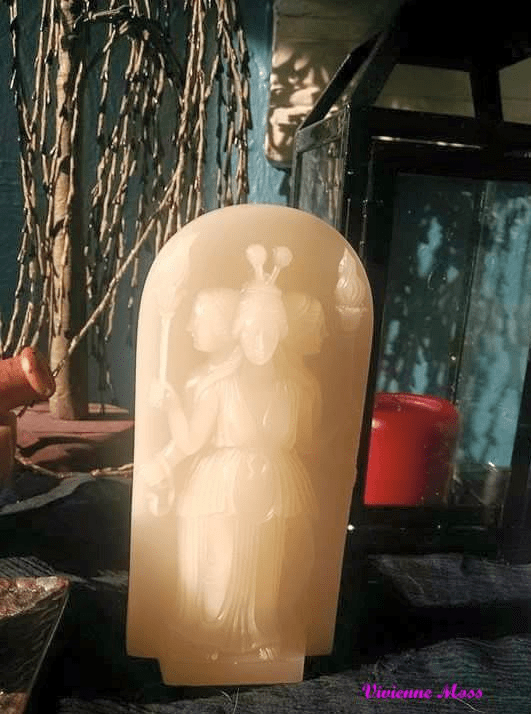 I found this lovely candle of Hekate on etsy. When you burn a tea light behind it, the wax figure glows. It was scented in oil and I occasionally anoint the wax with more. 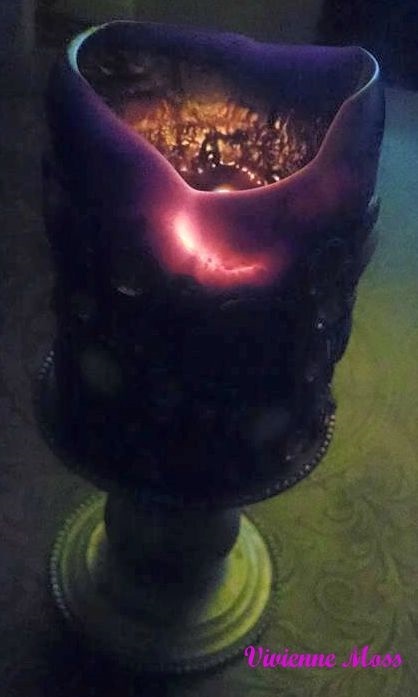 This is a beautiful way to show devotion to the Goddess of the Flame and each time I light the candle I ask Hekate to bless my home with happiness, health, and harmony. While there are many forms of candle magic, these are my favorites and ones that I use on a daily basis. Be creative with this bewitching art form, the beauty that comes from the making of candle spells will bring enchantment into your home and life. *There are many lists of the appropriate candle colors to use in magic as well as herbs and oils. I like to use my intuition on the making of many of my charms and spells. What one color says on a list may be different from how that particular color makes you feel.